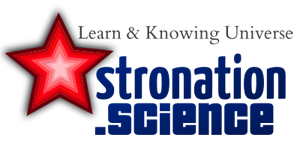 Astronomy Science ~ In a paper published in the Astrophysical Journal, astronomers tells the story about a distant galaxy that is now forming stars at a very rapid pace. The galaxy is forming a new star is thousands of times faster than our galaxy. In fact, this galaxy is forming more stars in a day than all the stars that formed the Milky Way in one year. Because this galaxy is very productive of star scientists with the National Radio Astronomy Observatory called it a cosmic powerhouse. Scientists call this galaxy as Aztec-3 which is about 12.5 billion light-years away from our planet in the Sixtans constellation and surrounded by three smaller and quieter. As shown in the figure, the Aztec-3 located between three small galaxies were identified as LBG-1, LBG LBG-2 and-3. When compared to its neighbors, the Aztec-3 larger and far more active. It is estimated, the galaxy is producing stars at a rate 1,000 times faster than the Milky Way. LBG galaxy-1, LBG-2 and LBG-3 also produces stars, but at normal speed. 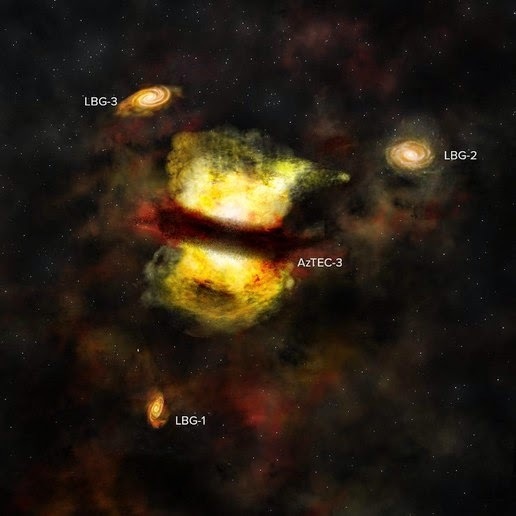 "ALMA data reveals that the Aztec-3 is very solid, very full galaxy with new stars at near maximum theoretical predictions and surrounded by neighbors more normal, but actively forming new stars," said astronomer Dominik Riechers. After taking time to study the anatomy and behavior, the scientists found that, Aztec-3 unlike other galaxies, this galaxy has less dust and gas rotation which indicates that at some uninterrupted movement point in its history. Scientists believe that the Aztec-3 was formed from the merger of galaxies. Moreover, he argues that this merger may take place recently. "Aztec-3 is currently experiencing an extreme event, however short-lived. It may be the most extreme phase in its evolution, leading to the degree of activity of star formation that is very rare in cosmic age," said researcher Dominik Riechers.